LONDON — The number of cable homes in Europe once again grew year on year in 2017, reaching 69.2 million and comprising 36.3 percent of all television households. This was the largest number of cable homes in Europe since 2009, when the figure stood at 70 million, according to the “European Broadband Cable Yearbook” from IHS Markit (Nasdaq: INFO) and Cable Europe. 2017 marked the second consecutive year of growth in cable homes following a period of stagnation since the previous 70 million high. 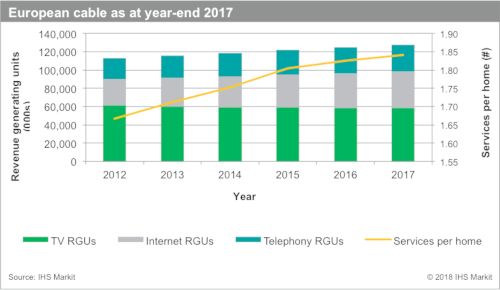 Total revenue generating units (RGUs)* rose 2 percent year on year to 127.5 million, largely driven by an increase in internet subscriptions. TV services accounted for 46 percent of cable TV revenue in 2017, followed by internet with 35 percent and telephony with 19 percent. Annual total cable revenue continued the steady growth path set in 2010, reaching €25.9 billion last year – up 2 percent compared to 2016. In terms of revenue growth, internet was the best-performing cable category, with revenue rising 4 percent to €9 billion in 2017. Telephony revenue contracted for the second consecutive year, declining 0.7 percent to €5 billion. Revenues for video-on-demand services increased in 2017, returning to growth following the category’s minor downturn between 2012 and 2014. Average monthly revenue per subscriber (ARPU) last year was €16.79 for television, €19.59 for internet and €14.35 for telephony. The rate of digitization of European cable TV homes grew in 2017. As the digital switchover gathered momentum, the number of digital subscribers grew 13 percent compared to 2016. A significant portion of this growth came from Germany’s Unitymedia, which switched off its analogue TV signals in July 2017. Mergers and acquisitions were once again a key characteristic of the European cable industry last year, including the sale of UPC Austria to T-Mobile Austria, Telenet’s purchase of Altice’s SFR Belux and Euskaltel’s acquisition of Telecable. However, these deals were somewhat eclipsed by the €18.4 billion Liberty Global agreement to sell key European assets to Vodafone in Germany, Hungary, Romania and the Czech Republic. Cable operators also made further enhancements to their services last year. For instance, German companies launched advanced TV services, including the rollout of the Vodafone GigaTV service and the Tele Colombus introduction of AdvanceTV. Both services crucially incorporated 4K capabilities. The use of Android TV for interactive TV services also became increasingly popular in Europe last year, as DNA in Finland and YouSee in Denmark both launched Android TV products. * A revenue-generating unit (RGU) is equivalent to an individual subscription. A single home can, therefore, represent several RGUs (for example, one each for TV, internet and telephony).